Read NODA’s fantastic review of Bah Humbug! 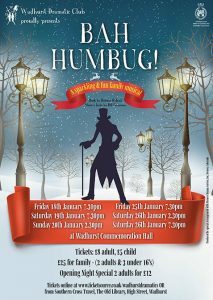 It may not be a Panto, but it is just as much fun for all the family… and it’s a story not just for Christmas. A reminder, perhaps, to be more forgiving and generous in the year of Brexit. Once again brilliantly directed by Kay Sasada, it features toe-tapping songs from the pen of Bill Francoeur, who you may recall from “Flapper!” and the hilarious “Way out West in a Dress“.